One of the traits that makes Nelson unique is our focus on and history of generosity. Starting with our founder, Gary Nelson, and the entire Nelson family nearly five decades ago, our organization has led by example with our support of organizations, causes, and people in need. Nelson family members and employees have contributed not only financial support but also thousands of hours of volunteer time to important causes. 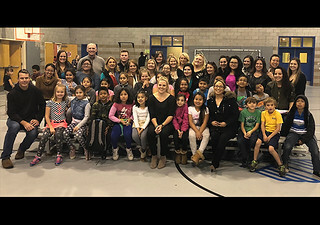 Our shared philosophy of giving has resulted in significant recognition for our company’s incredible level of generosity, frequently alongside companies that are much larger and have significantly more resources (such as when we were recently ranked 18 out of the top 100 corporate philanthropists in the Bay Area). To ensure we maximize the impact our charitable efforts going forward, we have formed the Nelson beCAUSE corporate philanthropy program to evaluate and select company-wide donations and sponsorships. Nelson beCAUSE is dedicated to strengthening the communities in which we live, work and play, through volunteerism, investment, and inspiring others to share our passion for giving back beCAUSE we care. Volunteered at the Boys & Girls Clubs in Sonoma and Santa Rosa. Contributed more than $100,000 to California Wildfire Relief Efforts. Made wishes come true for children through Make-A-Wish®. Brought the magic of Broadway to the North Bay by supporting Transcendence Theater Company. Contributed to a variety of Sonoma Valley schools and educational programs. Supported the health and wellness of women through the Power Walk benefiting Dress for Success. Brought awareness to those struggling to make ends meet with Second Harvest Food Bank. Supported the efforts of the Elsie Allen High School Foundation to help Santa Rosa high school students succeed. Raised awareness of the number one killer of women – heart disease – by participating in the American Heart Association’s Go Red for Women. Helped Santa reach more than 500 Sonoma County kids with donations of toys and supplies to the Boys & Girls Clubs. Nelson beCAUSE grants in the amount of $500 – $2,500 are available to qualifying non-profit 501(c)3 organizations serving California communities in which Nelson has a presence. *Grant applications must be received a minimum of 60 days prior to funds needed. Nelson beCAUSE gift matches are available to 501(c)3 organizations to which Nelson employees contribute. Please talk with a Nelson employee for more information. If you represent an organization applying for a match of a gift made by a Nelson employee, use our gift match request form. *If you are a Nelson employee requesting that your gift be matched, please see the Employee Gift Match form linked from the beCAUSE Nelson intranet page. Nelson provides regular time off for employees to support causes in our communities. We also organize special team-wide volunteer opportunities.Do you represent an organization seeking volunteers? Visit our online volunteer request form to submit your request for Nelson volunteers, and your request will be passed along to our local contacts in your area. Nelson beCAUSE is managed by rotating committee of Nelson employees. The beCAUSE committee reserves the right to adjust any program rules, requirements, and details at any point. If you have any questions or if you have a request that is not outlined within the opportunities here, please contact us. Thank you! Read more about Nelson’s beCAUSE community philanthropy efforts on our blog. Benchmark your salaries and discover California employment trends for 2019.